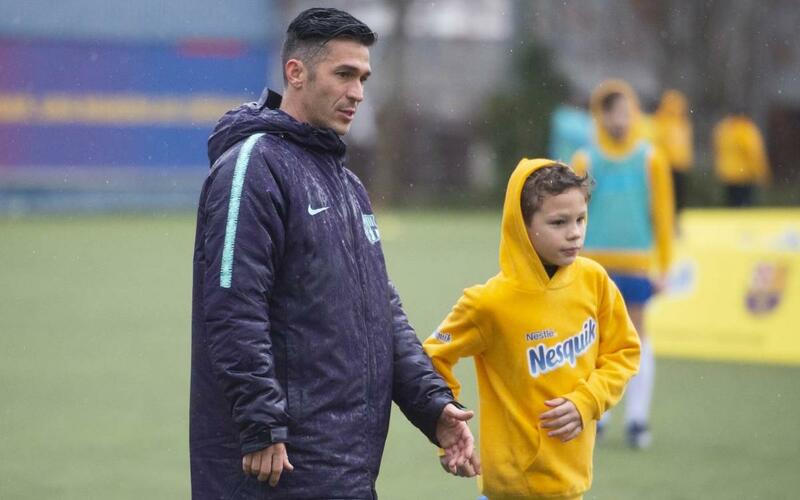 Former FC Barcelona player Luis Garcia has served as a special coach to a group of 25 boys and girls aged between 7 to 12 from Belgium, Croatia, France, Germany, Hungary, Poland, Romania, Egypt, Morocco, Mexico and the Dominican Republic. It was all made possible thanks to one of Barça's partners, Nesquik, and its campaign called the Ultimate Experience. These boys and girls won the chance to come to Barcelona by taking part in a curious experience. After purchasing Nesquik products, they were tasked with sending in a creative video with a challenge set out in a card inside the product. The most original 25 submissions were chosen, and the winners then travelled to Barcelona from all corners of the world. In addition to the workshop with Luis Garcia, held on the pitches annexed to the Miniestadi, the youngsters are also getting to watch the first team in action against Leganés, go on a tour of the Barça Museum and go sightseeing in Barcelona, ​​as well as enjoying a fantastic chance to meet people from all over the world and learn about different cultures.